All insect repellents work in a similar way by repelling and deterring insects. Insects are repelled from people wearing Jungle Formula and are less likely to feed if they encounter skin that has been treated. 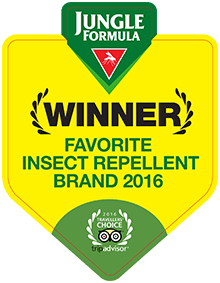 Jungle Formula is the UK’s number 1 selling insect repellent brand offering a range of products appropriate for every member of the family and for every destination. Where can I buy Jungle Formula? You can purchase Jungle Formula from most major retailers and pharmacists, as well as online. See our product page for more information. Apply repellent whenever you are going to be outdoors. Mosquitoes often are most active at dusk and at dawn but also during the day in tropical locations. Always remember to use insect repellents safely and read the product label and instruction before use. What Jungle Formula product should I use? You can find information on our product page, and also on the product labelling. Which Jungle Formula product should I use if I am visiting a country where malaria is endemic? When visiting any country with a risk of insect transmitted disease, you should use a product from the Jungle Formula Maximum range, which all contain 50% DEET and are endorsed by the Hospital of Tropical Diseases. It is also recommended to consult a doctor or travel clinic for information on malarial medication or vaccinations. What product to use to protect against Zika virus? For travel to countries where the is risk of insect transmitted diseases use Jungle Formula Maximum range which comes in aerosol, pump spray and roll on formats. You can also use a plug – in for your room while you are out and about that will kill any mosquitoes and small insects. Plug ins are not suitable for pregnant women. For maximum products, please consult with a healthcare professional before use on children. Jungle Formula Outdoor & Camping & Kids lotion also repels midges, wasps, mosquitoes, sand flies and horseflies. Jungle Formula plug in kills mosquitoes and other small insects. Can I use more of the products in Jungle Formula range at once? We recommend using a Jungle Formula most suited to the destination you are travelling to and our Kids products for children aged under 12. Jungle Formula Plug In and Bite & Sting Spray can be used in conjunction with the other Jungle Formula products. Can I wear sunscreen with Jungle Formula products? We recommend that you apply sun cream before the insect repellent. Once the sunscreen is dry the insect repellent spray can then be applied. This method of application is best to maintain the effectiveness of both the sun cream and the repellent. Does Jungle Formula contain DEET? The Jungle Formula Maximum products contain 50% DEET, which is approved by the Hospital for Tropical Diseases for travellers visiting tropical areas with a high risk of malaria and other insect transmitted diseases. 50% DEET is widely recommended by GP’s and travel clinics when visiting countries where insect transmitted diseases are endemic. The Medium range contains 20% DEET which is suitable for non-tropical destinations. Our Outdoor & Camping, Kids Lotion, Kids Slap-It Bracelet, Bite & Sting Spray and Plug-in/Refill products do not contain DEET. DEET is the common name for N,N-Diethyl-m-toluamide. It’s been in use as an effective insect repellent for decades and is approved as an insect repellent by the World Health Organisation. It is recommended for use in tropical destinations at risk of insect transmitted diseases. IR3535 similarly to DEET is also an active ingredient used in insect repellents and its full name is Ethyl butylacetylaminopropionate. IR3535 is approved by the World Health Organisation to use as an insect repellent. We use it in our Outdoor and Camping spray and Kids lotion as an effective repellent for non-tropical destinations such as Europe and the UK. Which product would you recommend if pregnant/breast feeding? Pregnant women should use the product most suitable for their destination, however the Plug-in/Refill product is not suitable for use. Prior to travelling abroad, you should speak to a healthcare professional for advice on protecting you and your family. Those that are, are marked with a flammable symbol and appropriate warnings. Are the products safe for asthmatics? The pump sprays, lotion and roll-on are suitable. It is normally best to avoid aerosols. Are the products suitable for children? Prior to travelling abroad, you should always speak to a healthcare professional for advice on protecting you and your family from insect bites. As we have a range of products, the age of use varies from 12 months and upwards. We recommend you read the labelling before purchasing the most appropriate product. Do I need to re-apply product after swimming? Yes, it is advisable to do so. Will the product damage or mark my clothes? Products containing DEET can cause damage to clothes and so direct contact should be avoided. Will the product discolour or affect my jewellery? Again, DEET can affect jewellery, so avoid direct contact. Where should I store the products? In a cool dry place, in line with the storage conditions on pack. Once opened/used, how long will the products last? Jungle Formula products have a shelf life of 3 years apart from the plug in which has a shelf life of 2 years. Check the expiry date on the product or feel free to contact us here with the batch number if there is no expiry date. Where can the 2-pin Jungle Formula plug-in be used? Due to a technical regulatory change in the law, we have updated the instructions for use across Jungle Formula Maximum Aerosol and Jungle Formula Medium Aerosol products, in line with current regulations. There will be a period of time that the product you are using may contain instructions which are different to the most recent advice. It is always appropriate to follow the instructions given on the product labelling. However, if you wish to follow the most recent advice, you can do this at your discretion. The formulation of these Jungle Formula products has not changed, they remain of high quality and are suitable for use as insect repellents/insecticides. To ensure safe use of the products, you should always read the label and use in line with the instructions for use. -	Up to 10 hours maximum protection from a single application. -	For areas with a high risk of malaria and other insect transmitted diseases. -	For adults and children from 3 years. Apply carefully to all exposed clean and dry skin except for eyes and lips. For use on face, spray into palm of hand before applying. *Re-apply as necessary, depending on conditions, as high temperature, humidity and other environment factors can reduce the duration of protection of all insect repellents. Reseal container securely after use. Store in a cool dry place. -	Up to 3 hours maximum protection per application. -	For areas with high risk of malaria and other insect transmitted diseases. -	For adults and children from 12 years. Apply a generous amount gently and evenly over the bare skin that needs protection. Do not spray directly onto the face. Adults & Children 12+: Apply to forearms & feet or lower legs, or equivalent when not using other skin products. Use clothing to cover any untreated areas of skin to restrict access to biting insects. There can be no simultaneous use with other products such as sun lotions. Do not use on children under 12 years old. If you are under 12, contact a doctor before use. Do not use more than once a day. After returning indoors, wash treated skin with soap and water. This product is intended for external non-professional use only. Avoid contact with eyes and mouth. Avoid contact with food, plastics and lacquered surfaces. Close the bottle well. Keep the product dry and do not place it in direct sunlight. Do not reuse the packaging and do not dump the product into the environment. Factors such as high temperature, humidity and transpiration can influence the duration of protection of all insect repellents. Repeat application after swimming, showering or when the efficacy decreases. Keep in a safe place. -	For use in counties with no known risk of malaria or other insects transmitted diseases. Apply carefully to all exposed clean and dry skin except for eyes and lips. For use on face, spray into palm of hand before applying. *Re-apply as necessary, depending on conditions, as high temperature, humidity and other environmental factors can reduce the duration of protection of all insect repellents. Reseal container securely after use. Store in a cool dry place. -	Up to 3 hours medium protection per application. -	For use in countries with no known risk of malaria or other insects transmitted diseases. Apply a generous amount gently and evenly over the bare skin that needs protection. Do not spray directly onto the face. Adults and children 12+: apply to lower arms & legs, & tops of feet, or equivalent. Use clothing to cover any untreated areas of skin to restrict access to biting insects. Can be used with other skin products such as sun lotions. After returning indoors, wash treated skin with soap and water. This product is intended for external non-professional use only. Avoid contact with eyes and mouth. Avoid contact with food, plastics and lacquered surfaces. Do not use on children under 12 years old. If you are under 12, contact a doctor before use. Do not use more than once a day. Close the bottle well. Keep the product dry and do not place it in direct sunlight. Do not reuse the packaging and do not dump the product into the environment. *Factors such as high temperature, humidity and transpiration can influence the duration of protection of all insect repellents. Repeat application after swimming, showering or when the efficacy decreases. Keep in a safe place.